RICHMOND, Va. (AP) — A commission studying what to do with the most prominent Confederate monuments in Richmond, Virginia, recommended Monday removing one honoring Confederate President Jefferson Davis. 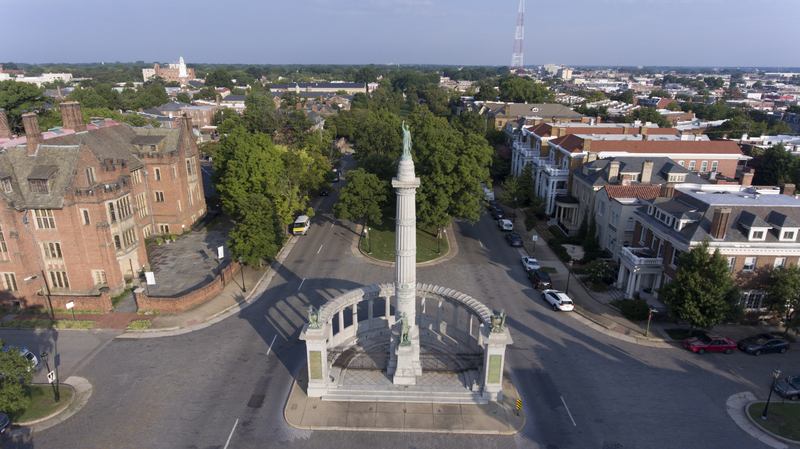 The panel of historians, local officials and others that spent around a year studying and soliciting public input about the statues on the city’s historic Monument Avenue also urged the addition of permanent signage with historical context near the monuments. Further, leaders should add new monuments that would reflect a “more inclusive” story of the city’s history, the commission said in a more than 100-page report. “In the course of the work, it became abundantly clear the majority of the public acknowledges Monument Avenue cannot and should not remain exactly as it is. Change is needed and desired,” said the report, which is not legally binding. Richmond, a former capital of the Confederacy, has some of the largest and most prominent Confederate monuments in the United States, where a mass shooting at a black church in South Carolina and a white nationalist rally in Charlottesville have heightened a national debate over whether such symbols should remain on display. The commission studied what to do with the five soaring Confederate statues that dot Monument Avenue, a prestigious residential street lined with mansions and divided by a grassy median. The Davis statue “is the most unabashedly Lost Cause in its design and sentiment,” the report said in a reference to an interpretation of the war that historians say romanticizes the South and de-emphasizes the role of slavery. An inscription on the Davis monument, for instance, “styles the Confederate president as a ‘Defender of the Rights of States,'” the report noted. That monument should be removed, pending litigation or changes in state law, said the report, which suggested that one part could be relocated to Davis’ grave at Richmond’s Hollywood Cemetery. A state law currently on the books, which the Republican-controlled General Assembly has shown no appetite for changing, prohibits local governments or others from “disturbing or interfering with” memorials to war veterans. The statute is at the center of a lawsuit playing out in Charlottesville over that city’s effort to remove two Confederate statues. When Stoney first announced the formation of the commission, he said the statues should not be taken down but should be supplemented with historical context about why they were built. But after a white nationalist rally in Charlottesville last summer descended into violent chaos, the mayor expanded the panel’s mandate to include removal as a possibility. While the Richmond commission completed its work and a similar study took place in Louisville, Kentucky, many other U.S. cities moved more quickly after the Charlottesville rally to take down their Confederate statues or symbols. For instance, four Confederacy-related monuments were hauled away in Baltimore just days after the rally. In Memphis, Tennessee, city leaders used a legal loophole to get around a state law protecting historical memorials by selling the city parks where three Confederate leaders stood to a nonprofit, which swiftly removed the monuments under the cover of darkness. The panel in Louisville, Kentucky, released a report Saturday saying public displays honoring the Confederacy were unwelcome and not representative of the city today. In Richmond, the first monument, honoring Gen. Robert E. Lee, was erected in 1890, decades after the end of the Civil War. The other statues — to Davis, J.E.B. Stuart, Thomas “Stonewall” Jackson and Matthew Fontaine Maury, an oceanographer and commander in the Confederate Navy — were raised in the early 20th Century, when Jim Crow laws were eroding the rights of black citizens.